I just spent 10 minutes reading this piece (and the panes). A nice prestige booklet with lots to display when broken down. 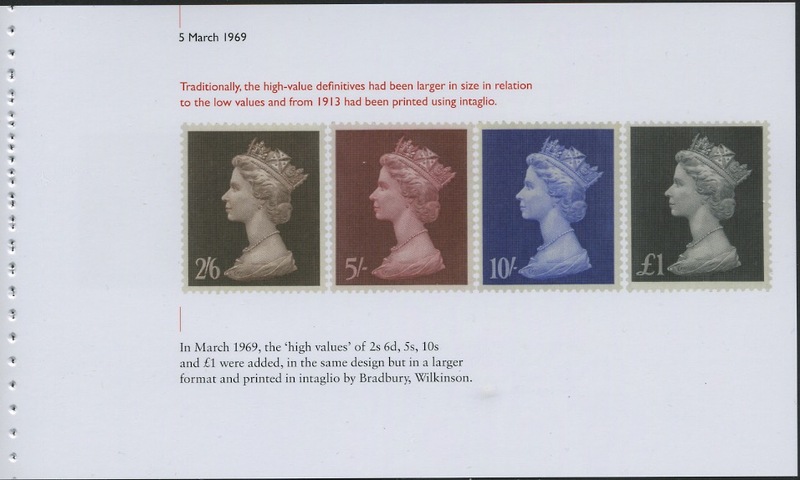 Can you post a pic of the Pane with 4 x gold foil £1 values in Litho? 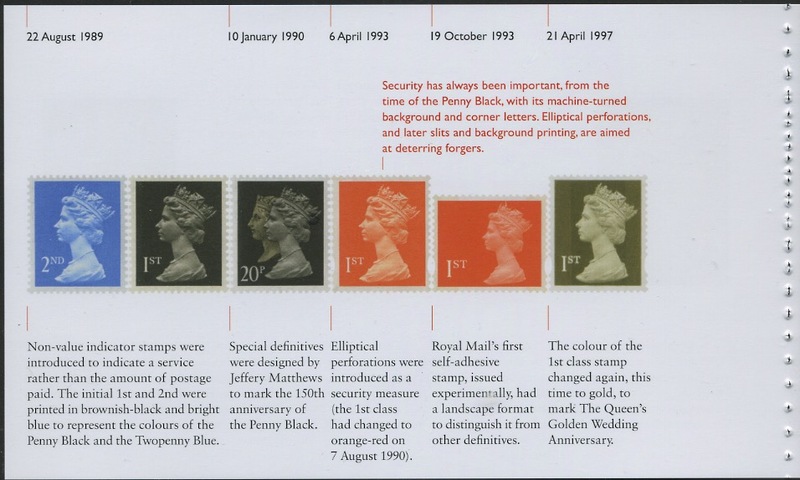 Royal Mail should take a note out of your book on how to display stamps on their website, it would certainly increase sales. 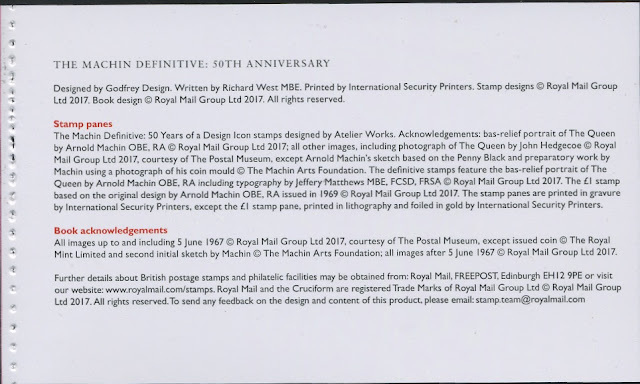 Even their large images are quite small and you can't even tell what stamps are real on their picture of the golden anniversary celebration stamp sheet. Another book in the pack was only half-stitched - would have been easier to separate! One thing have only just noticed about the decimal values in the Perpetua font: they use a capital I instead of a figure 1, without exception! 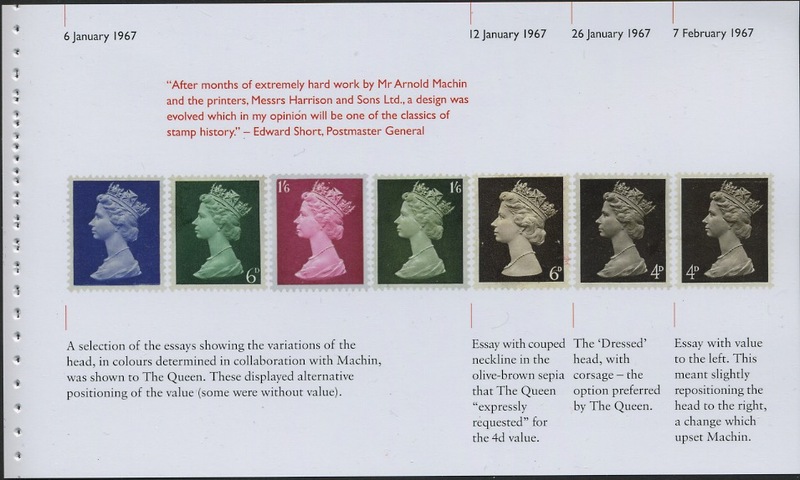 Before the values were "slimmed down", they also used a capital O instead of a figure 0 (e.g. the initial 10p (or IOp!) stamp. 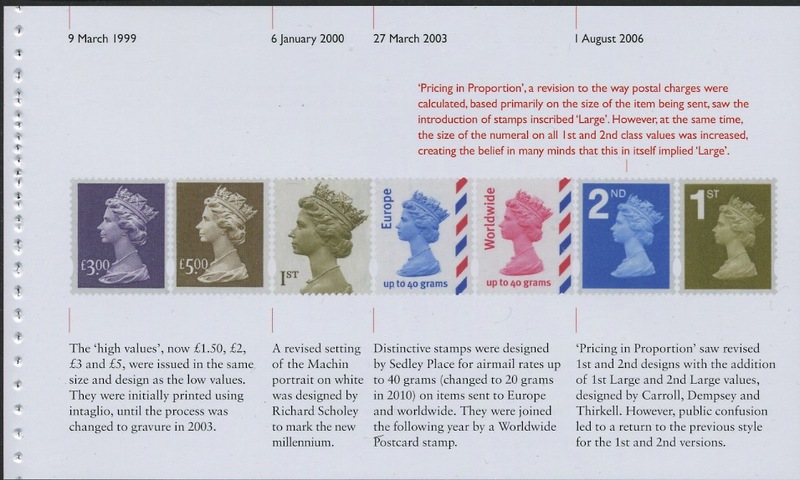 Incidentally, does anyone know the rationale behind having two of the predecimal stamps with the value at the right? It seems bizarrely inconsistent for such a sleek and minimalist design. Douglas Muir's book, "A Timeless Classic" discusses the placement of the value. 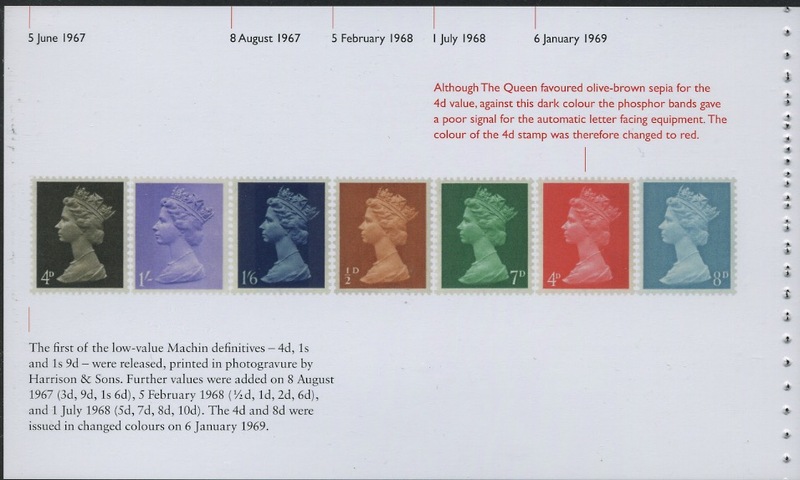 Machin actually preferred having the Queen's head centered on the stamp and the value at lower right. 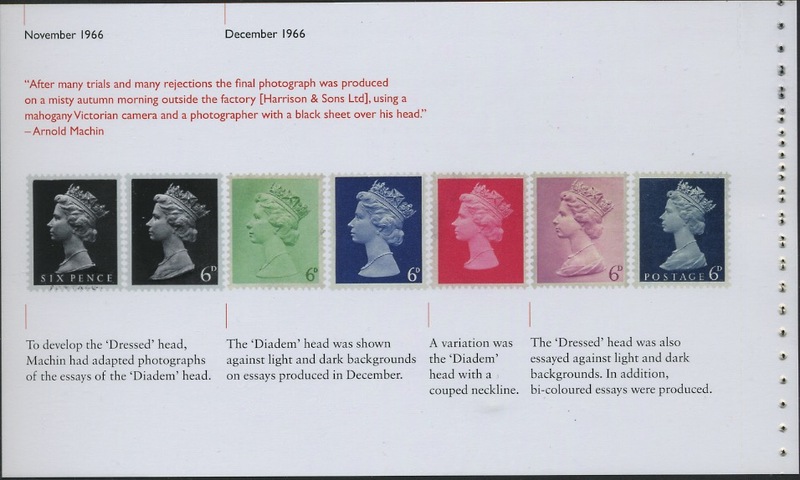 However, the Queen was shown both and preferred the value at lower left, with the head shifted slightly to the right. 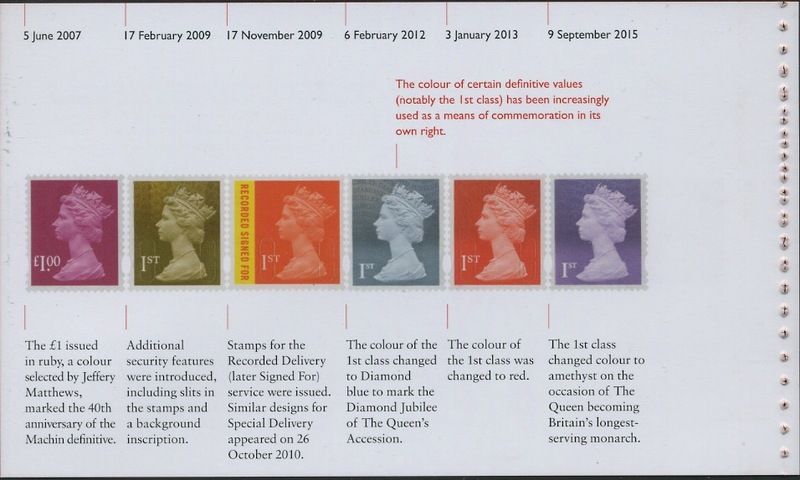 This would also leave more room for denominations of one shilling and above. However, PMG Short, who also preferred the value on the left, requested approval of a mix of positions to help his staff differentiate the values. The Queen's representative said it would be okay to have one or two denominations with the value on the right. As for why this was discontinued, my guess is that it was determined that the consistency of all values on the left was desirable, and so that was done when the decimal versions were issued in 1971. 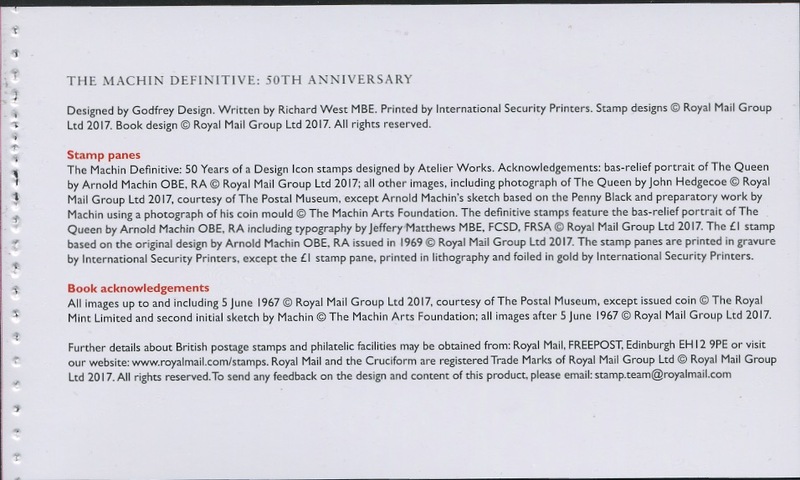 Well, I agree that the Machin miniature sheet and the prestige book are both winners and that they have probably found a good balance of "new" stamps. 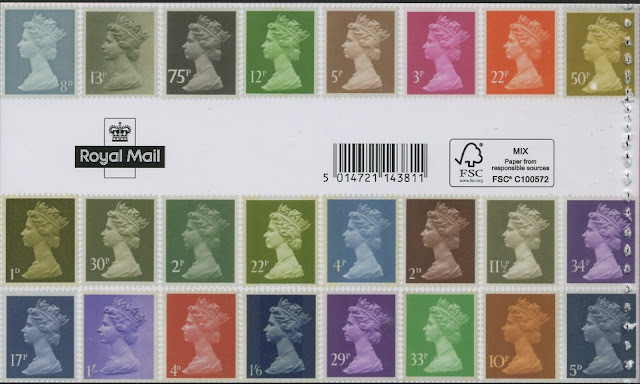 I would have to agree about the £1 stamp. It does look a bit gimmicky to me, but that's a personal preference. 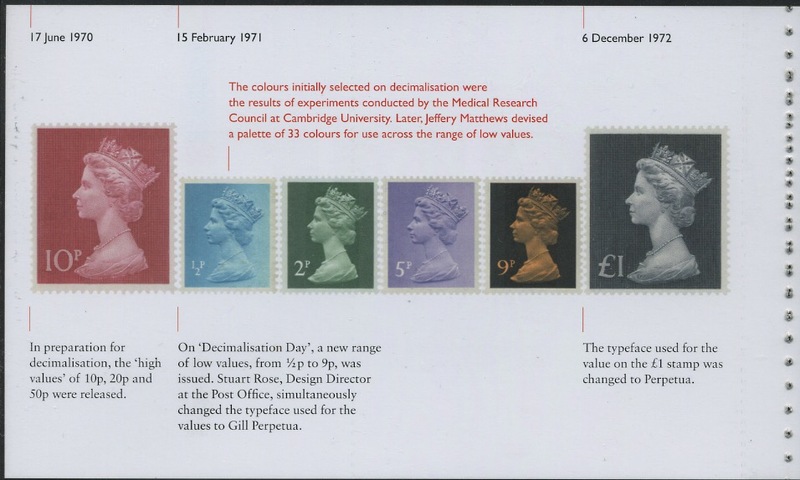 I think it would have looked better printed in the 1st gold colour instead. 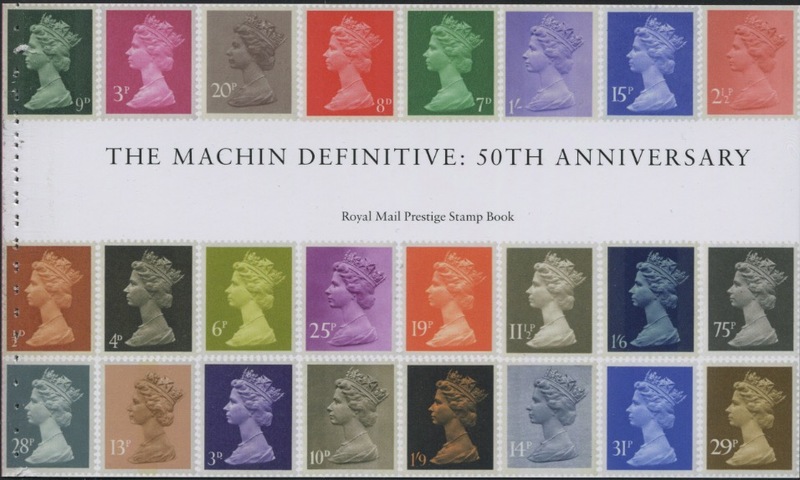 Apart from That, a great selection of machins to add to my collection. Can anyone say who printed them? I have seen them listed on a specialised dealers website as being Cartor in gravure. 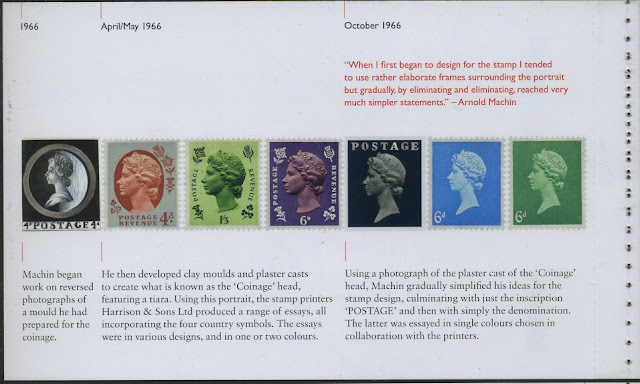 I thought it was the Walsall arm of ISP that printed in gravure and Cartor printed in litho, or am I mistaken? I can only say that what is printed on the inside back cover (above) agrees with what we were told by Royal Mail - as we would hope. 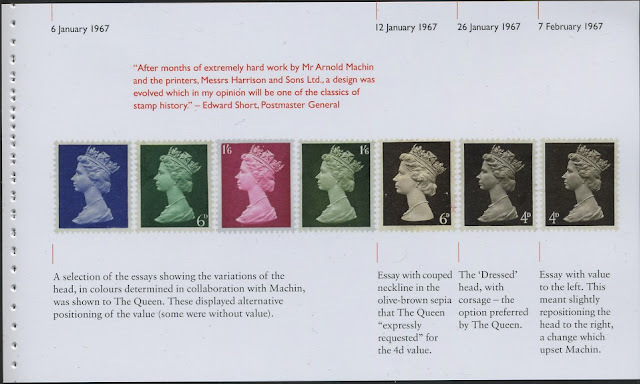 I understand that both Walsall and Cartor arms of ISP have both litho and gravure capacity, even though we have so far been told that Walsall work is gravure and Cartor litho. Interesting Ian, I didn't know that (your 2nd paragraph). 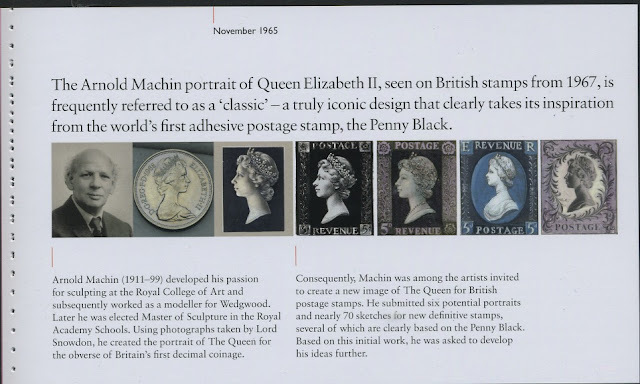 I've deleted my previous comment as I meant to say that the Machin panes definitely look gravure to me. 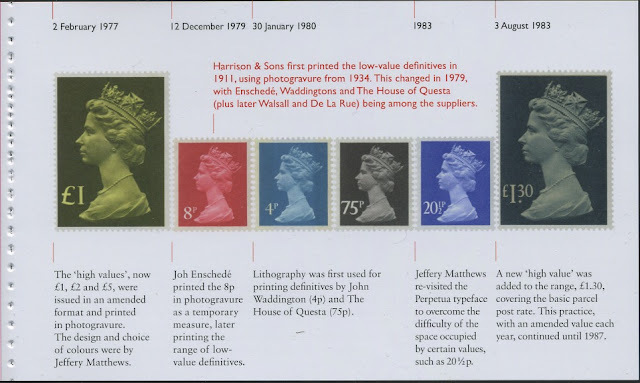 The iradescent overprint appearance on the 1st and £1.00 Ruby suggests to me they were printed by Walsall. OK, it's not exactly scientific, but it looks the same as other gummed Walsall printings. That's how I'll be writing them up anyway. Ian, thank you for the reply. I wasn't aware that Walsall and Cartor both had litho and gravure capability. 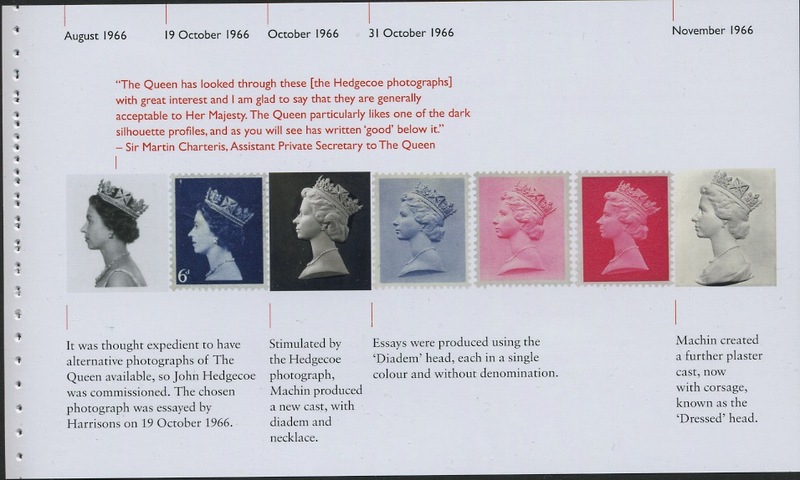 Trelantis, I looked at the PSB panes under a hand held microscope and they are printed in gravure. The phosphor bands look like they may have been applied using lithography.